In today's complex health care system, nurses play a central role in providing medical care, advice, and health services to the public, working in large hospitals, health care centres, small clinics and rural nursing stations. 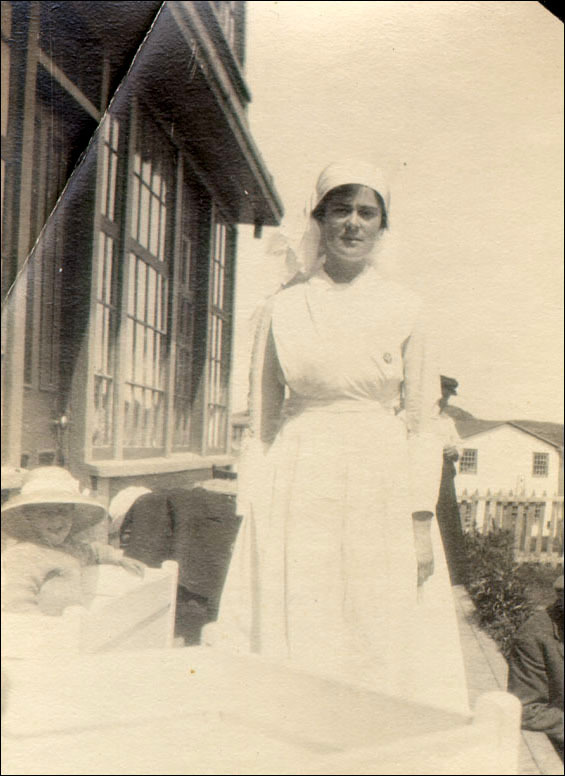 Nursing has a long history in Newfoundland and Labrador, and nurses have been important in providing patient care in homes and hospitals since European settlement began. It is only within the past century, however, that nursing as a profession has became a major part of the health care system and gained the respect and status it has today. Until the mid to late 19th century, nursing was not usually the job of professional nurses. Caring for the sick and injured normally took place in the home, and women acting as nurses did so as part of their domestic household duties. Few women were paid for this work, and those that did make their living by nursing were sometimes forced to by personal circumstances, such as widowhood. Treating patients in their homes without modern medical knowledge of disease, nutrition, and so on was often risky. Nonetheless, nurses in these situations could provide one-on-one patient care in a manner not often possible in large hospitals. As medical standards changed and hospitals became the primary sites of medical care, nurses became regular hospital employees, an important step in the development of the nursing profession. Hospitals were established in Newfoundland in the early 1800s, and nurses were hired to provide basic patient care and domestic services such as cooking and cleaning, as well as basic, day to day administration. Both men and women worked as hospital nurses, and sometimes were former patients with little or no training. They learned about patient care on the job, and were often illiterate. In 1869, Dr. Charles Crowdy of the St. John's Riverhead Hospital, dismayed by the inability of most nursing staff to read the instructions on medicine bottles, started night classes to teach reading and writing. Nursing was not a particularly well-paid or well-respected profession. Though nurses were better paid than domestic servants, doctors often complained that it was difficult to find women willing to undertake the work. Working conditions had much to do with this. The nurses at the St. John's Riverhead Hospital (located where Victoria Park is today) lived in its basement in poor conditions, and often fell victim to the same diseases they were attempting to treat. Janet Cowan, for example, who became matron (head nurse) of the St. John's Hospital in 1860, died of tuberculosis in 1865, most likely contracted at the hospital. In 1870 conditions were so bad at the Riverhead Hospital that it was moved to the recently vacated military hospital on Forest Road, although the Riverhead Hospital continued to receive fever patients until 1888. Religious orders also provided medical care, visiting the sick in their homes and working in hospitals. The Sisters of Mercy, brought to Newfoundland from Ireland by Bishop Fleming in 1842, opened schools and tended to the sick. They worked in deplorable conditions at this time, risking infection from typhus, cholera, and smallpox in order to care for the sick, clean infected houses, and prepare bodies for burial. Undertakers often refused from fear of infection. Several 20th century hospitals in St. John's owed their existence to religious groups. Sister Mary Clare of the Presentation Convent opened the “White House” hostel for young girls on Lemarchant Road in 1913. The “White House” evolved into a hospital in 1922, and into St. Clare's Mercy Hospital in 1939, staffed largely by sisters from the convent. The Grace Maternity Hospital was opened in 1923 by Dr. William Roberts, who had previously operated a small hospital for women in his home, and requested the assistance of the Salvation Army in setting up a proper maternity hospital. The first trained maternity nurses to work there were Salvation Army officers from New Brunswick. By this time training was becoming more important as medical standards improved and a new emphasis was placed on disease control. To provide this training, most hospitals soon opened nursing schools. The medical care provided by hospitals and convents in St. John's and elsewhere established the need for trained nurses. Military nurses in the American Civil War (1861-1865) and the Crimean War (1853-1856) set a high nursing standard. The most notable of these was Florence Nightingale, who set up the first true nursing school in London in 1860. By the end of the century these schools had turned nursing into a recognized profession. Mary Southcott, a St. John's nurse who trained at the London Hospital, founded the General Hospital School of Nursing in 1903. For the first time, nurses could receive proper training in Newfoundland. The first four students graduated in 1906, and by the 1920s the school was accepting ten nursing students a year. The Grace Maternity Hospital, which previously offered an eighteen-month midwife training program, began offering a three-year nursing program in 1929 when it became the Grace General Hospital. The St. Clare's nursing school opened in 1939. The influence of religious orders and the residential nature of nursing schools made nursing an almost exclusively female occupation. Male nurses had worked in hospitals in the early and mid-nineteenth century, but by the 1920s and 1930s almost all trained nurses were women. Hospitals now demanded trained nursing school graduates with specific skills based on the scientific study of medicine. By offering formal training programs, nursing schools helped turn nursing into a professional vocation with clear requirements. There were few professional nurses working outside St. John's before the 1920s. Several organizations tried to overcome this problem by recruiting nurses outside Newfoundland and funding their placement in rural communities. The first of these was the Grenfell Association, which since the 1890s had been recruiting nurses from Great Britain and North America to work in remote communities in southern Labrador and northern Newfoundland. Nurses in rural areas like St. Anthony provided primary health care to hundreds of patients, and worked in hospitals, isolated nursing stations, and out of homes. Photographer unknown. From the Grenfell Mission Photograph Album, Maritime History Archive. Reproduced by the permission of the Maritime History Archive (PF-325.032), Memorial University, St. John's, NL. The public health benefit of the Grenfell Association's nurses was obvious, but its services were limited to a specific area. The Newfoundland Outport Nursing and Industrial Association (NONIA) sought to expand rural nursing services to the rest of Newfoundland. Established as the Outport Nursing Committee in 1920 by Lady Constance Maria Harris (wife of governor Sir Alexander Harris), it originally raised money to pay half the salaries of nurses hired to work in outport communities, with the government paying the other half. The Committee hired six nurses in 1920, but struggled to retain them after their original two year commitments expired. The Committee was restructured by Lady Elsie Allardyce (another governor's wife) and renamed NONIA in 1924. The new plan involved raising money by buying homemade knitted goods from rural women and reselling them. The proceeds were to finance the recruitment and salaries of nurses, aided by government grants. Inspired by the success of NONIA and the Grenfell Association, in 1934 the Commission of Government established a district nursing system, recruiting nurses and posting them to remote communities where they worked with little supervision or medical support. They were responsible for maternity cases, school health, nutrition, child welfare and other community health needs. There were 54 district nurses in 1936. A second nursing service, the Public Health Service, was created in 1937, and the two services combined in 1941. By 1944 there were 94 district nurses working in Newfoundland. Many worked in cottage hospitals, but many others worked on their own without the support of a doctor or extensive medical facilities. 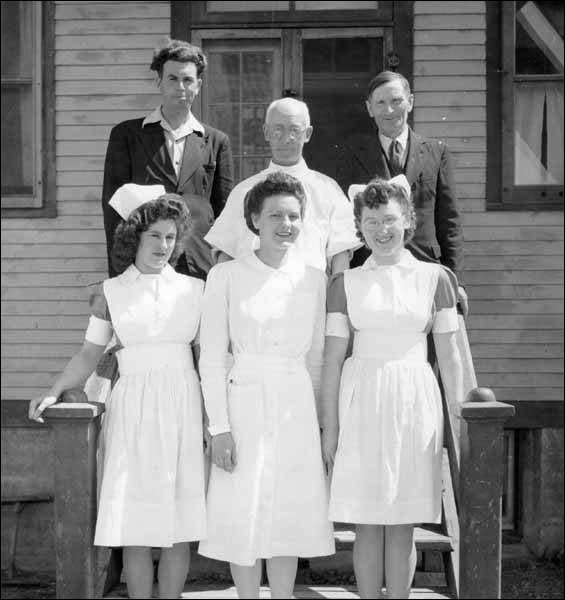 Dr. C. A. Forbes and staff at the Bonavista Cottage Hospital. At rear (L-R) are B.H. Dunn, Dr. C.A. Forbes and Abel Mouland. In front (L-R) are Aggie Cramm, nurse's aid, an unidentified nurse, and Joan March, nurse's aid. The hospital opened in July, 1940. Photographer unknown. From the Forbes Family Fonds, Maritime History Archive. Reproduced by the permission of the Maritime History Archive (PF-318.280), Memorial University, St. John's, NL. After Confederation, funding increases, old age pensions, family allowances, and health insurance allowed better access to health care and increased the need for trained nurses. Newfoundland joined the federal-provincial hospital insurance program in 1958, and the extended Medical Care Plan in 1968. There were also increasing demands for regulation and oversight. Accordingly, the Association of Registered Nurses of Newfoundland and Labrador (ARNNL) was created in 1954 with a mandate to regulate the nursing profession and protect public safety. Convents and residential nursing schools ceased to be the primary means of training and certifying nurses, and the profession once again became accessible to men. By the 1970s, male nurses were graduating from the nursing schools in St. John's and Corner Brook, and are now quite common. The nursing school at Western Memorial Hospital in Corner Brook opened in 1969. As of 2017, there were three independent schools of nursing: Memorial University School of Nursing in St. John's, the Centre for Nursing in St. John's as well, and the Western Regional School of Nursing in Corner Brook. The educational qualifications of nurses have been increasing since the 1970s. A BN degree is now the minimum requirement for entering registered nurses to work in Newfoundland and Labrador, and master's degrees are becoming more common. In 2017 there were approximately 6300 registered nurses and nurse practitioners in the province, in all parts of the health care system.